A damper is essentially a plate inside the wood stove's flue. When the damper is closed, it seals off the flue, or chimney. When it's completely open, airflow through the flue is unrestricted. Adjusting the damper controls the amount of air that passes through the firebox. By regulating airflow, a damper affords some control over how quickly a fire burns. It also helps to contain heat loss through the chimney, so that heat is retained for the living space. A damper helps direct heat and smoke properly. Locate the damper handle on your wood stove flue. The mechanism that controls the damper typically rotates to the right or left, but some push in and pull out, while others slide back and forth. Move the damper handle so you can discover which position is fully open and which is fully closed. Open the damper completely when first starting a fire. This maximizes the volume of air that passes over the flames, helping the fire get a quick start. 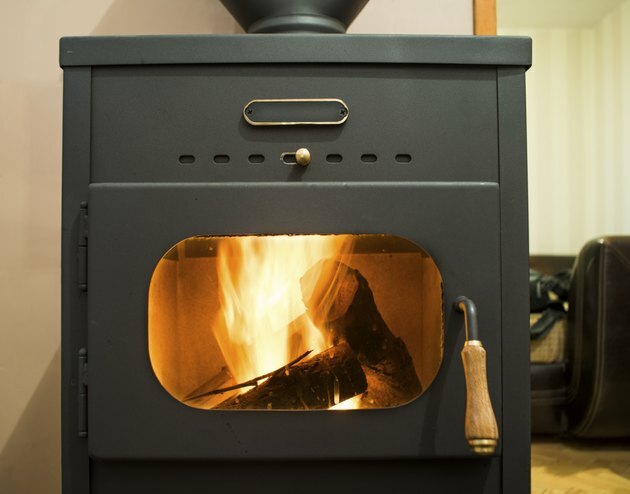 Operating the wood stove with the flue completely open also allows heat to rise into the flue, rapidly establishing a good draft. Close the damper part way -- about halfway between fully open and fully closed -- as the fire becomes more established. Look for orange and red coals inside the stove as an indicator of when to make this adjustment. This is a good starting point for determining where to position the damper so that heat is redirected into the home while smoke continues to exhaust out the flue. Adjust the damper slowly, allowing the fire and smoke discharge to stabilize with each incremental position between the halfway starting point and where the damper setting maximizes heat efficiency and smoke withdrawal. Open the damper before opening the stove door to add wood. This helps to keep smoke from puffing out into the room when the door is open. Once the wood has caught fire and the stove door is closed, return the damper to its optimum operating position. Open the damper completely when allowing the fire to die. If the wood stove has adjustable air intake vents, close them with an open damper and the fire will expire. What Are the Settings on a Pellet Stove?